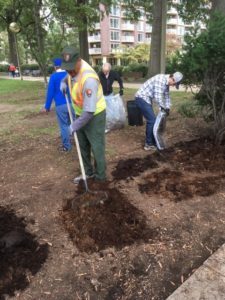 On Saturday, Oct. 13, the Friends of the Titanic Memorial Park (Friends) and the National Park Service (NPS) teamed up to make improvements to the beautifully-designed, mid-century modern Titanic Memorial Park. 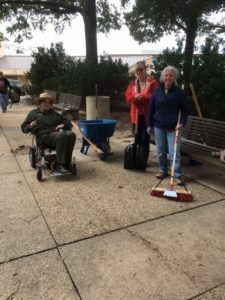 The work party included planting flower bulbs and weeding planters, removing dead bushes and mulching planting beds, and cleaning debris from activity wells. Rae Emerson, the NPS Partnerships Specialist and community liaison to the Friends, was on hand to assess park conditions and plan future projects. 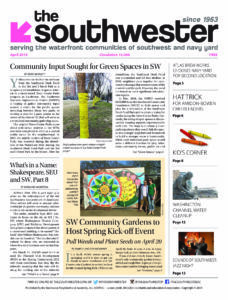 The Friends, co-founded last year by Corinne Irwin and Donna Hanousek, in affiliation with the Southwest Neighborhood Assembly (SWNA), has a formal partnership with NPS and assists it with park clean up, gardening, conditions assessments and planning. The park runs from the intersection of 4th and P Streets (at Ft. McNair), west to the Titanic Memorial, and then north along the Washington Channel until you get to the new Southwest Waterfront Park at N Street. If you care to learn more about the park or the Friends, you can visit the website at https://www.fotmpdc.org or the facebook page at www.facebook.com/FOTMPDC/.